Having been mainly sampling pork sausages in our journey, lamb ones are definitely "other than pork", so we must certainly give these a go. 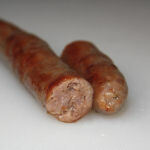 I'd heard from a friend that these taste just like what could be a "doner kebab" sausage, and being intrigued for sure with this, I called in to see Jason Drage the owner of the Churchgate Sausage Company to pick some up. From initial impressions these are long at 200mm (8") but I was anticipating a bit of shrinkage with lamb generally tending to as it cooks up. Ok we found as expected some shrinkage agreed but don't be fooled, the bite and texture are very good. The taste though is really, really good and yes we can confirm "doner kebab" is definitely there. 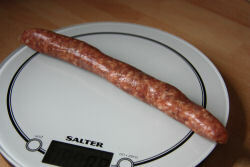 A very meaty sausage this with the right amount spice to interest the palette. A mixed reception from the others here unfortunately, but I know what I like and I'm happy to say so. 200x22mm before cooking, 176x20mm after. 65g before cooking, 51g after. That's a shrinkage of 20% & weight loss of approx 21%. Souvlaki - a popular Greek fast food consisting of small pieces of meat and sometimes vegetables grilled on a skewer. May be served on the skewer for eating out of the hand, or in a pita sandwich with garnishes and sauces, or on a dinner plate, often with fried potatoes. The meat usually used in Greece and Cyprus is pork, although chicken and lamb may also be used.